Bobby Abley brought the cast of Looney Tunes, neon fur, and bejeweled tracksuits to his A/W 18 catwalk to show the power of fun within fashion. In these dark and uncertain political times, it can be hard to remember that fashion does not need to be brought down with it. Bobby Abley certainly proves this by bringing an explosion of colour, pop culture and a generous helping of glitter to the final catwalk at London Fashion Week Men’s 2018. While most Autumn/ Winter palettes are filled with browns, greys and black, Abley brought bright neon colours and dramatic textures to his latest collection. Rainbow fur hoods, bright braided hats, and Looney Tunes influences gave Abley a show that finished Fashion Week with a bang. Completely reinventing the rules of Autumn/ Winter fashion; From The Streets features some of our catwalk favourites below. Bringing Bugs Bunny to the runway, this outfit was a joy to behold. With a sportswear influence, the Bugs Bunny Detailing takes this classic tracksuit to a whole other level. Featuring distinctive neoprene material and clean silhouette that truly makes the detailing pop, the logo cap with braids is one of the staples within this collection. Completed by a lacey styled white trousers for a bold styling choice, the strongest aspect of this look is that while it was a favourite on the catwalk it remains so simple and wearable. Abley’s spin on sportswear encourages experimentation while showing how small yet dramatic changes can really elevate sportswear classics to new heights. A dramatic standout of the collection, this outfit is essential Bobby Abley. Editorial yet whimsical, the colour palette of yellow and oranges really brings together the daring textures and diverse fits of the collection. More is more for Abley as matching fur, bejeweled bands on the sleeves and layered styling puts some of his best pieces together. Unusual and daring, Abley prides himself on making daring statements and to have fun with fashion with these pieces championing Abley’s goal: a vibrant fashion world where everyone is welcome. Bringing festival inspiration to the runway, Abley brought a unique and bohemian theme through this outfit. Bellowing sleeves and an oversized fit are complemented by the eclectic pattern mix and cartoon inspiration to make an innovative streetwear statement. Even more daring, the glitter-wool blend trousers and headscarf offer a cohesive colour palette while staying true to Abley’s message of vibrancy and innovation. Styled with simple boots, this outfit is one-of-a-kind and is sure to make waves all the way into music festivals fashion this year. Taking further contemporary hip-hop inspiration, Abley included daring coloured grills and bunny ear bandanas such as this within his Autumn/ Winter collection this year. Grey fur and wide sleeve plaid were as close as Abley was willing to get to neutral colour this year. 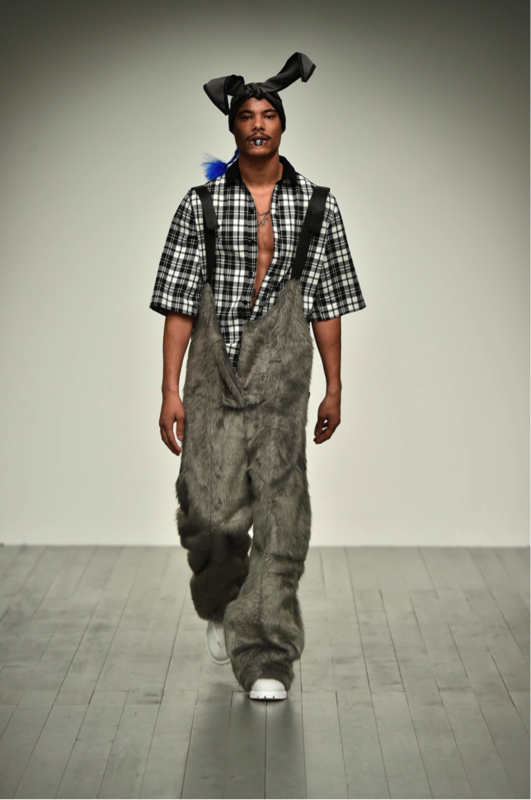 In an oversized dungaree style, the fur texture of this look moved beautifully on the catwalk while the open plaid shirt brought an editing eye to this outfit. Completed with a splash of colour in the fur-tipped braids at the back, this dynamic look brings Abley’s colourful world and modern streetwear together in one of the strongest shows of the season.